I want to tell you a little story. Your daddy and I got married in 1999 and about a year later, we decided that we wanted to expand our family. Month after month, year after year ... we were not successful in achieving our dream. After about three years, we began undergoing fertility treatments. Cycle one ... not pregnant. Cycle two ... not pregnant. Cycles three and four ... not pregnant. We moved on to more invasive treatment, something called in vetro fertilization. Cycle one ... we found out I was pregnant! Finally, after all these years, our dreams had come true. We were going to have a baby ... and that baby was you! While I was pregnant, you were a feisty little thing. I sang to you every morning on my way to work and you would kick me to let me know you were listening. I will never forget the day you were born. I already knew you were a feisty little guy and you kept it up by refusing to leave my belly. I pushed and pushed for two hours ... nothing. We found out you were facing the wrong direction, or "sunny side up". That and the fact that you had such a big head ... well nothing was getting you out, not even the doctor's vacuum seal on your head. So off to the operating room we went for a cesarean section. All I remember is hearing you cry ... it was the most beautiful thing I had ever heard. You were such a handsome little guy ... and you had a lot of dark hair! You were a very happy, easy going baby. As you began to get older, you were always into something ... and you haven't stopped since. 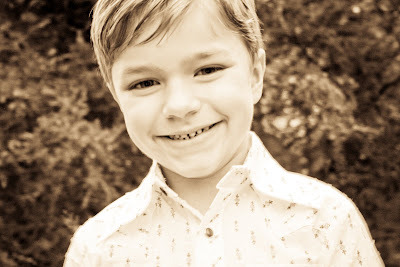 The fact that you are turning five years old today boggles my mind ... you are definitely every bit of five! You have so many qualities that I adore ... you are thoughtful, funny, loving, enthusiastic, compassionate ... the list goes on. You are a leader among your friends and you persevere in everything that you do. You are the best big brother ever ... your "babies", as you like to call your sisters, adore you. Happy 5th birthday, Bubs. You make me laugh every day ... I love you so much! Please stop growing up so fast, because I can barely keep up! Happy Birthday gorgeous boy! You have grown so much since I first seen your photo in your Mummy’s sig on Down syn. I love reading about what a lovely big brother you are, but more than that I love reading about your antics you sound like such Fun to be around. I’m sure God has many plans for your life, Mason and I’m sure with your parents guidance you will hear his plans just as your Mummy and Daddy have. I hope you had a great day big Boy. Happy birthday! There is just something so special about watching our little guys grow up. I can hardly believe how the time flies and what a cool little guy my son is becoming. Mason is such a good big brother. Have a fun day. Happy Birthday Mason!! I love hearing all of your funny stories. I have a son just like you who will be five later this year. He loves to cook with his mommy too! Aw, what a special birthday letter! He will love reading that again when he's older. Hope his birthday was extra special! What a sweet post. Happy Birthday Mason! happy belated 5th birthday to Mason!